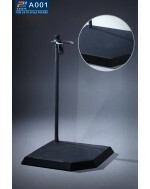 2X 1/6 Scale Figure Stands With Name Tag Base size: approx. 13 x 8.8 cm Name tag size: a.. IN STOCK!! Custom 1/6 Scale Black Gloved Hands Compatible with Hot Toys Male Figure Body ***Cl.. Dynamic Stand For 1/6 Scale Action Figure Display ***Click to enlarge below pictures***..
OneSixthKit 1/6 Height Adjusting Leg Extension Set This set comes with: - 4 pair of regular fo..